At the February 27, 2018 monthly meeting of the Texas Fly Fishers, Danny Scarborough http://www.houstonflyfishing.com will be making a presentation about fly fishing in and around Houston. 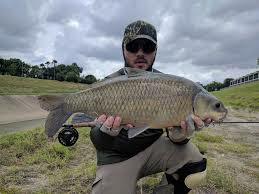 Danny’s presentation will include urban fly fishing for carp, gar, tilapia and whatever else shows up; bass, carp, gar, crappie and white bass fly fishing on Lake Houston; fly fishing for bowfin, bass, gar and carp on Lake Conroe; and, fly fishing private lakes for big bass and huge bluegill. Danny is a very knowledgeable fly fisherman and talented fly tyer so his presentation should be a good one. There is no charge for admission and all are welcome at the meeting. So, if you are interested in learning more about the fly fishing world, if you are interested in watching some fly tying before the meeting or are just interested in socializing with a friendly group of fly fishing men and women come to the February 27, 2018 monthly meeting. We would be glad to have you and look forward to seeing you at the meeting. Can’t wait to meet you guys , I plan on attending the meeting . I’m new to this fly fishing world and can’t wait to get started.